The running season is now well underway and it is great to see participation in both of the Club grand prixs, a fantastic 11 Harriers running at 3 Villages 10 miles last weekend. Marathon season is also now kicking off, Steve Head heading towards his 3rd of the season at the iconic Virgin Money London Marathon on 28th April, Chris Wood completing his first marathon at Manchester last week accompanied by Nicky Wood and Carol Elliot who both had great races as well – apparently the flattest marathon in the UK. I decided to be different and took on the Exmoor Coastal marathon, a tough rugged course following the north Devon coast line with dramatic sea views to keep me company. There is a great signup for Troon 10K, the bus journey should be full of banter, but I would also say to other Harriers not attending that the Holywood Stroll is Tuesday 7th May, a great local event and we are keen for Harriers to support this event. Our first Club race the Mabie 10K trail race takes place on 9th June 2019, and I hope that as many Harriers as possible will support this either by running or volunteering. We cannot run this event without marshalls out on the course, manning the water station and the finish line crew. It is usually a great morning out, and this year we hope that you will join us for the informal BBQ / picnic afterwards. Tuesday nights continue to be really well attended and now that the nights are getting lighter, we can return to a few of the more rural routes outwith the street lights of Dumfries and perhaps a few more runs around Heathhall Woods. We will also aim to have a few nights up at Mabie to try out the trail running. 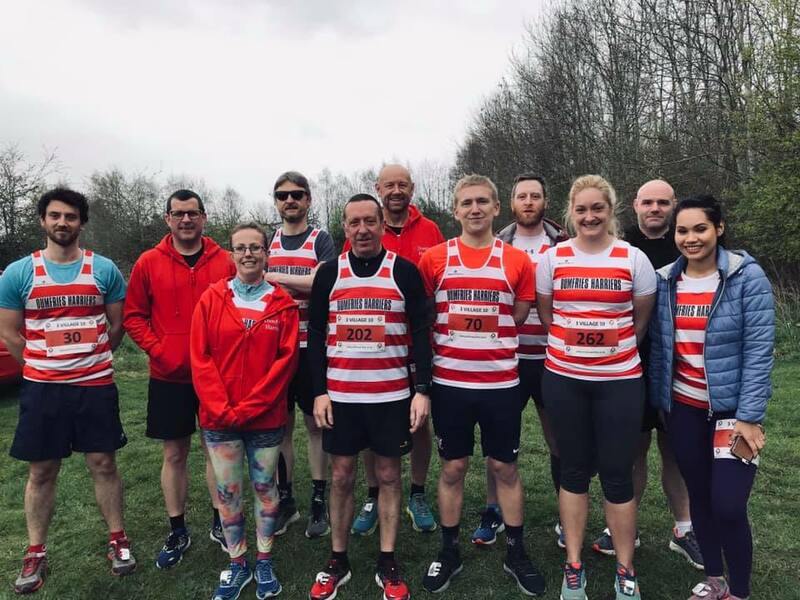 When I started running I had never heard of Parkrun and once I discovered the ethos of the event I had to take myself off to Carlisle to take part. We are so lucky to now be able to attend the Crichton Parkrun, a great way to set your weekend up with a 5K timed run around the beautiful Crichton Estate. Run entirely by volunteers it is great to see club members supporting this venture both running and volunteering, if you have not tried it, get yourself registered, get your barcode and go and enjoy.